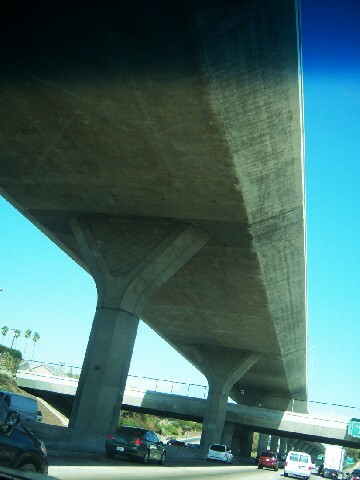 A vantage point when crisscrossing freeways. All photographs by A. Hiemer. Power plant just north of LA Port. Important part for harbor business. 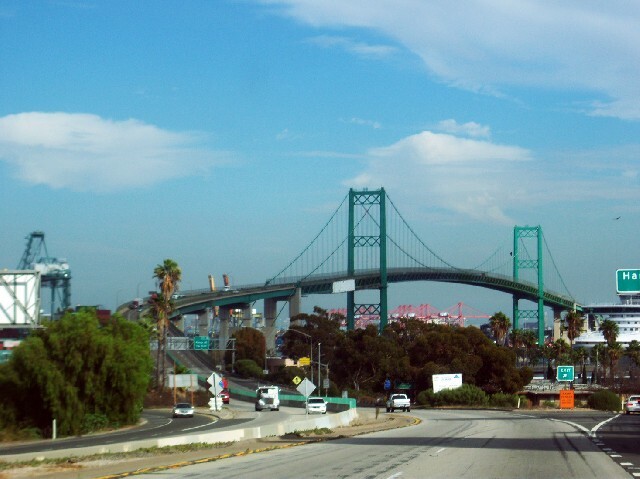 The Vincent Thomas Bridge still vital at LA harbor. 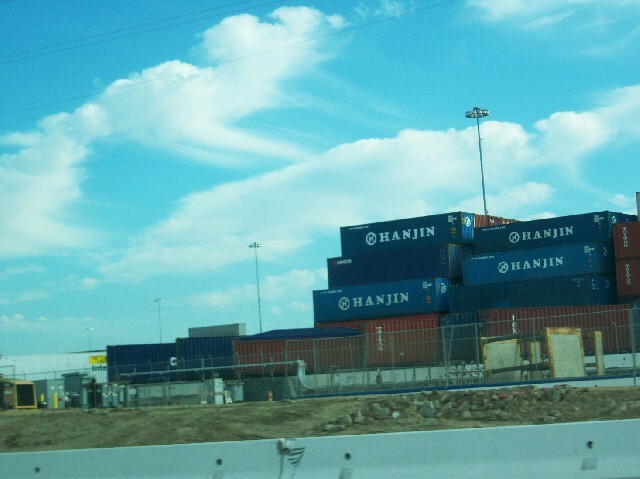 Efficient transport method, more containers. 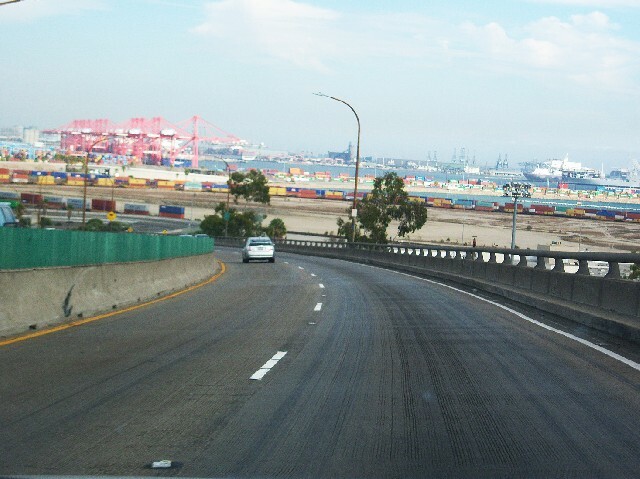 Approaching the Vincent Thomas Bridge. 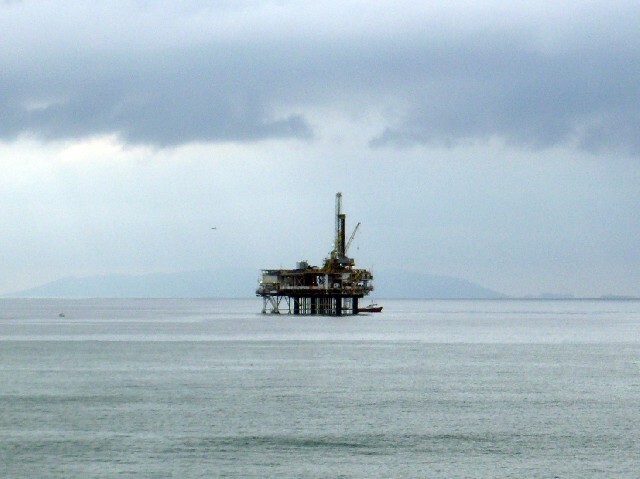 Oil rig way out, near harbor. 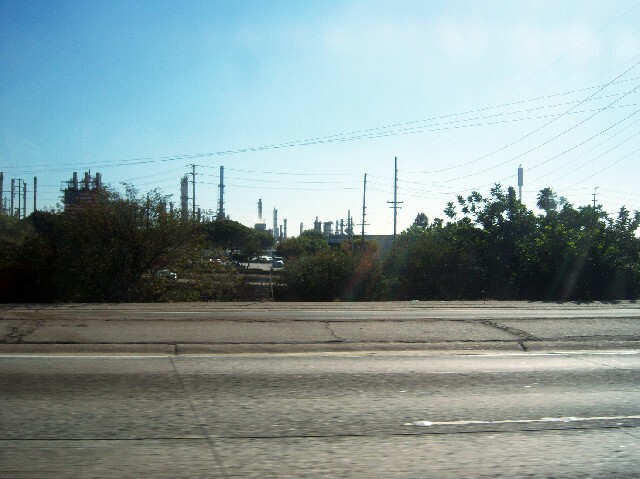 Oil refinery and storage facility. 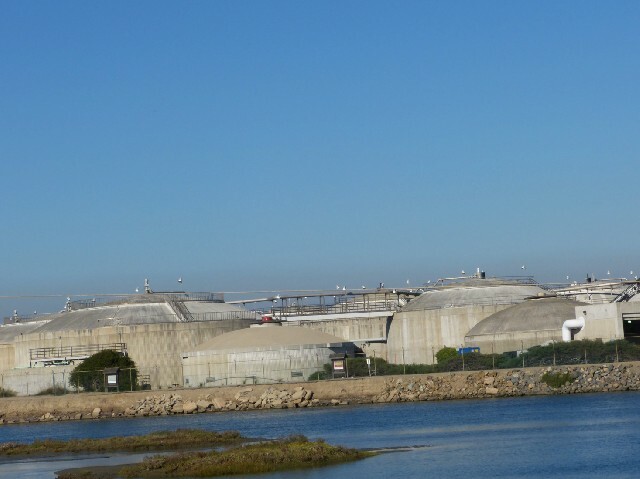 Storage tanks along Route 1. 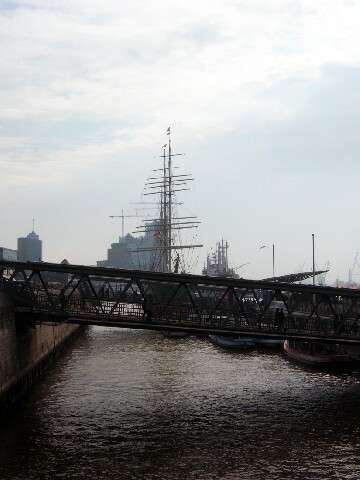 ’Ueberseebruecke’ with schooner and passenger ship. 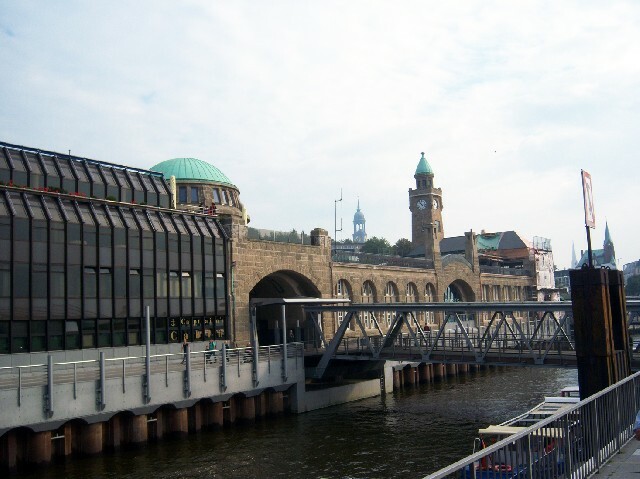 'Landungsbruecken,' 100 year old series of bridges and landings. Same location, view from deck of restaurant. Activity along the water front. Tourist boat and Blohm+Voss, Dock 17. Seagulls at home in every port. In front of elevator door below in tunnel area. On Sundays only people are permitted. 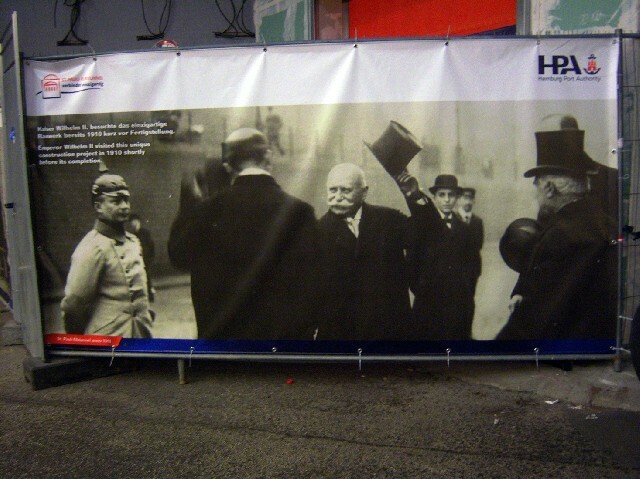 Text: Emperor Wilhelm II visiting the Elbtunnel shortly before its completion. Docks along the Fish Market. 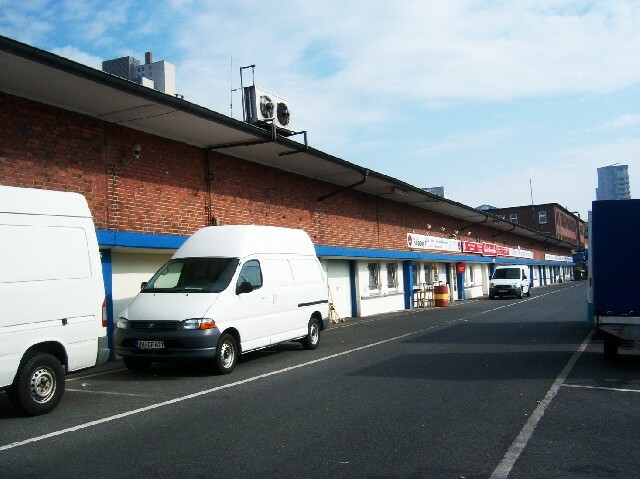 Distribution Center at the market. 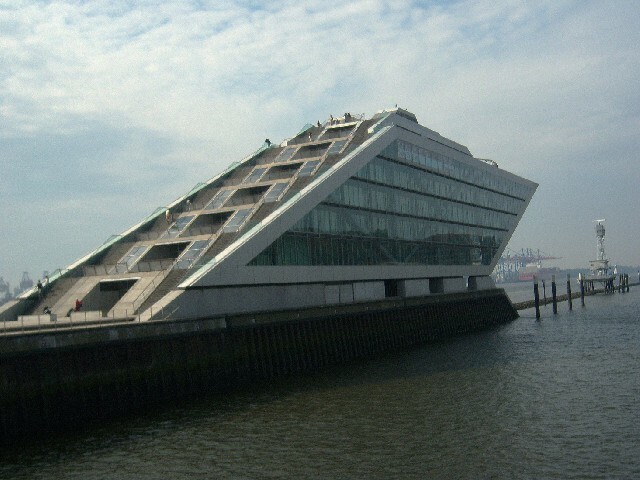 A ship-like business center. Actually the new terminal for cruise ship travel. As well as a visitors attraction. Container Ship approaching the Port of Hamburg. Where? At the new cruise ship terminal away from the harbor. 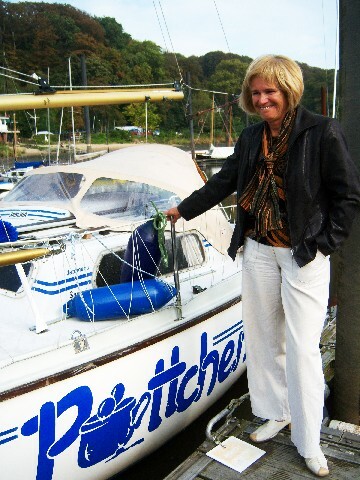 Cousin Monika Pott at their sail boat named: Poettchen. 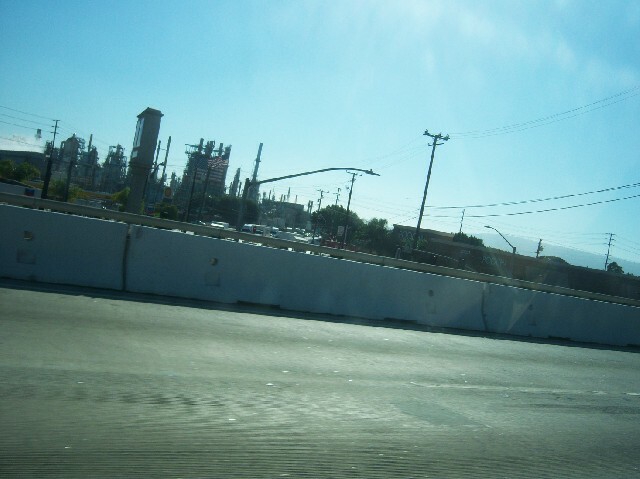 We spent a five minute long joy-ride through the Port of Los Angeles on Route 110 South to Route 1. We were returning before sun down from the city to our temporary home, a seaside condominium at Sunset Beach/Huntington Beach. On the way up I looked carefully for the LA Harbor entrances, which appeared to be just one, entrance and exit - in and out! How can that be? 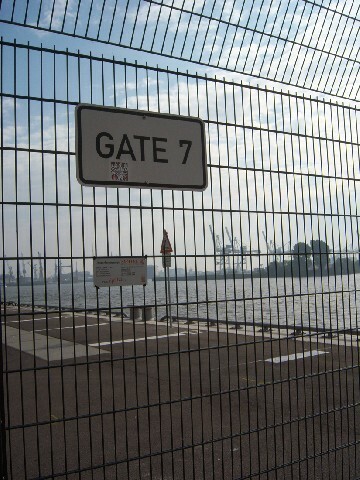 This big and important harbor can be accessed only by one exit/entrance? There was no time to investigate as we zoomed along, while Charles, the driver, kept asking: “Are we still on the correct road?” Yes we were, and I tried to photograph as fast as possible significant harbor images, while actually hollering to my heart’s content: “What a sight, what a view!” I wished we had more time. 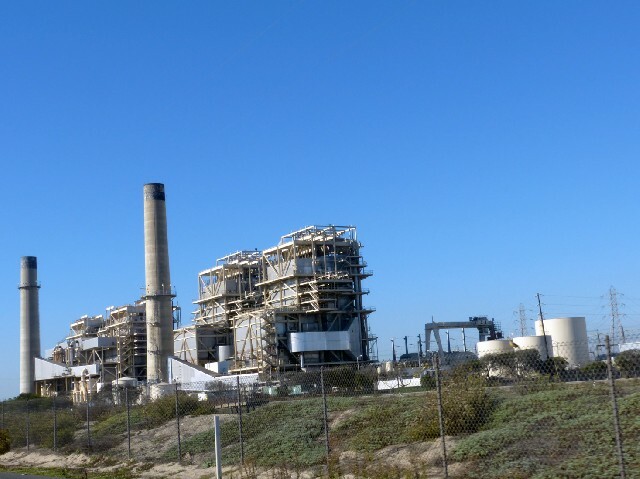 First, we passed a large power station, just north of L.A. Harbor, in place for its tremendous need of energy. 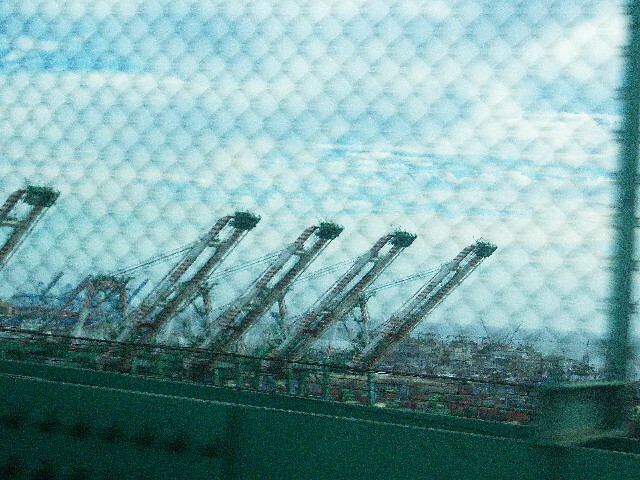 Then we spotted dozens of huge cranes on both sides of the freeway. 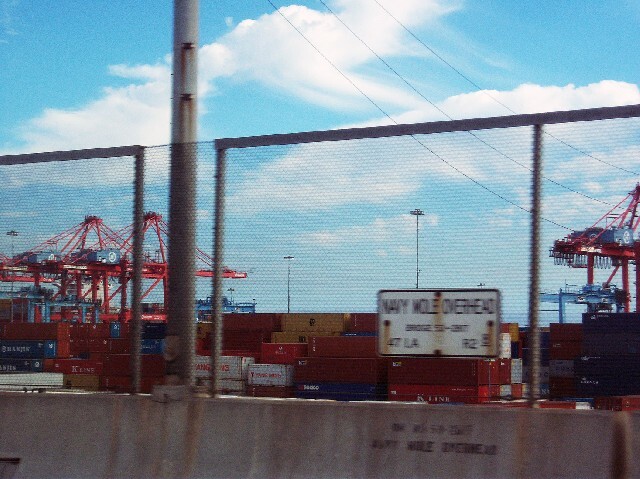 L.A. is the largest distribution port (Umschlaghafen) in the US. I photographed mountains of shipping containers, the current mode of transportation for a myriad of goods, developed since the 1960/70s. We only zoomed by few container ships that day, however, we had observed ocean liners from Sunset Beach in the far distance and knew that they had anchored, waiting their turn to enter the harbor. 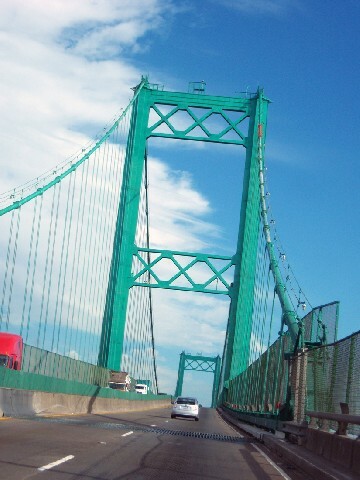 Finally, before exiting the port area we crossed one of those ocean-green steel monsters, the Vincent Thomas Bridge. It’s a fabulous old style bridge and we so enjoyed the ride while crossing it! Then, we drove on along the coast to our temporary domicile, last November, at a beach community. Far off the coast we could see a sizable oil-rig and huge oil storage tanks dotted the landscape here and there along the bay. It was at the L.A. Airport that I shared some thoughts about our week with a fellow traveler. She wanted to know, what had mostly excited me about L.A. Oh, we had seen all the important museums, and the J. Paul Getty Museum is very impressive! 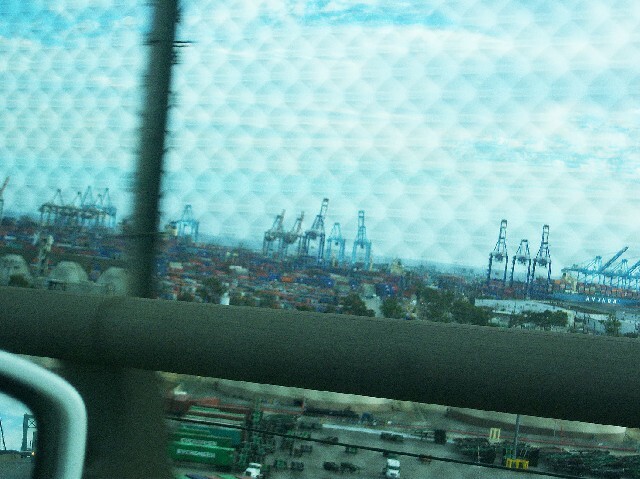 Yet, our ride along the Port of L.A. had enthralled me. 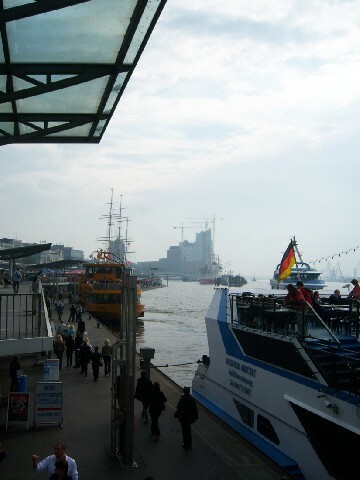 I grew up near Hamburg Harbor and whenever I return to Hamburg, I must visit. It was from the Uebersee Bruecke (Transatlantic Bridge) on a Norwegian Combi-Freighter that I left Germany and emigrated to the USA in 1967or was it 68? The ship’s voyage of ten days, to New York Harbor with ten passengers on board, as well as freight destined for two other ports along the route. 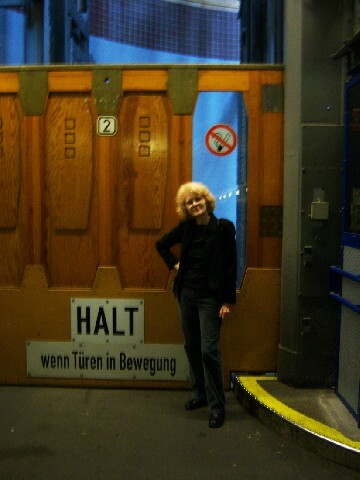 In 2011, during my most recent trip to Germany, I saw that fateful exit-bridge again. 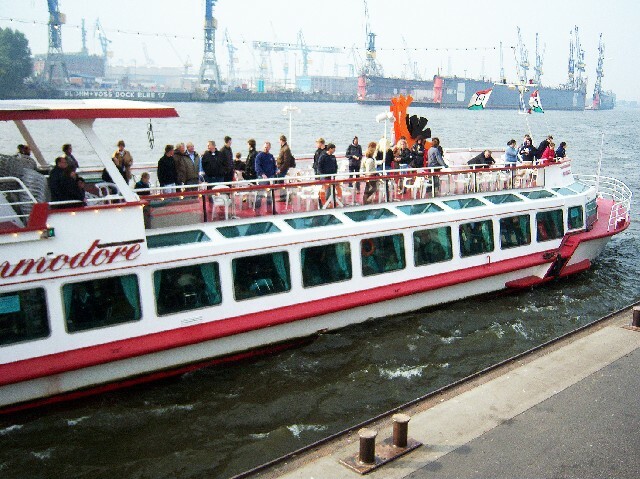 Cousin Monika Pott and husband, Gerhard, invited me on a daylong journey cruising the harbor and Elbe River that has connected Hamburg, with oceans and the world for 800 years. 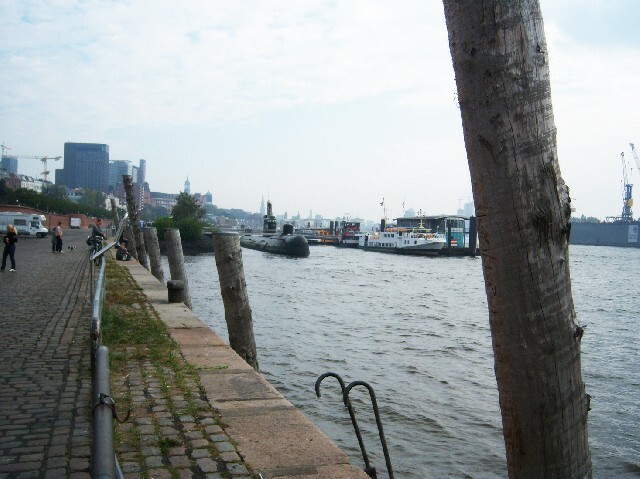 Hamburg Harbor is a working port as well as a tourist and cultural attraction, unlike L.A. Port, where visitors are barely welcome. 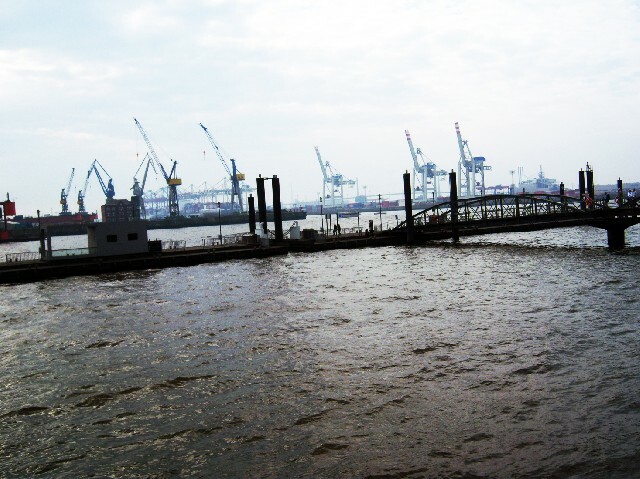 Hamburg is also the second busiest harbor in Europe. Growing up in the city, the family went to important ship launches of huge oil tankers and passenger ships. We also participated in the festivities of the Hafengeburtstag, a yearly celebration of the harbor’s birthday in May. The three of us first stopped at the Landungsbruecken, a series of bridges, where a fleet of boats transport passengers in many directions from one side of the harbor to the opposite side or further up the Elbe. 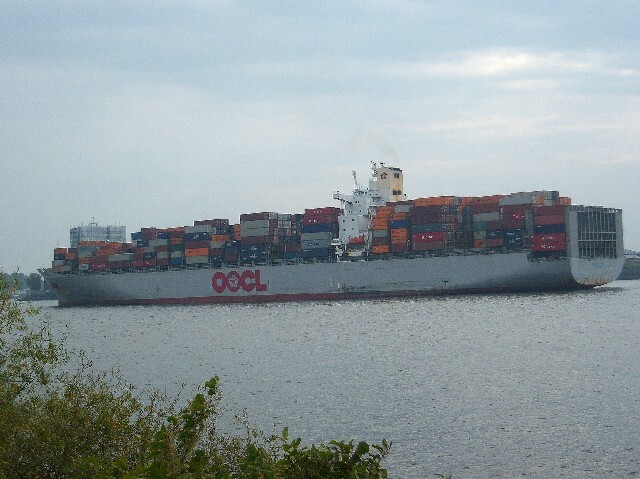 They are usually making short trips to docks, container ship locations, harbor cruises and more. 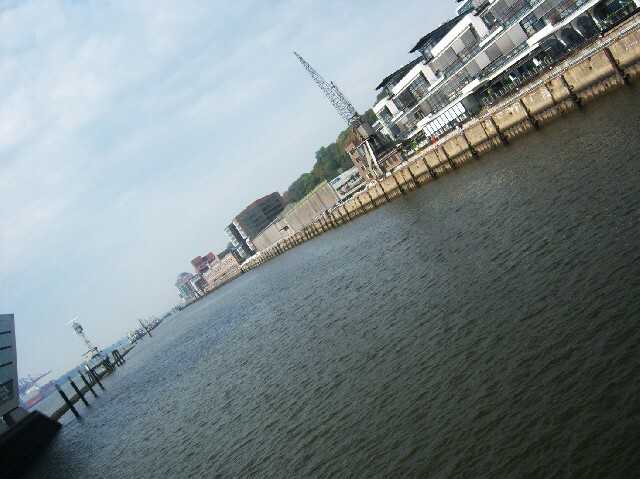 Hamburg’s Freihafen, the tax free port, was abolished in 2013. The transportation of taxable goods of any kind has drastically changed over years. J.H Bolland & Co. was my first employer at age 19, an import/export company with many decades long ties to Mainland China. The company also traded with India, Japan, European countries and the USA. Parts of my responsibilities were to declare proper tax values for the goods that Bolland imported for distribution in Germany and neighboring states. Well, then, ports are in my blood! 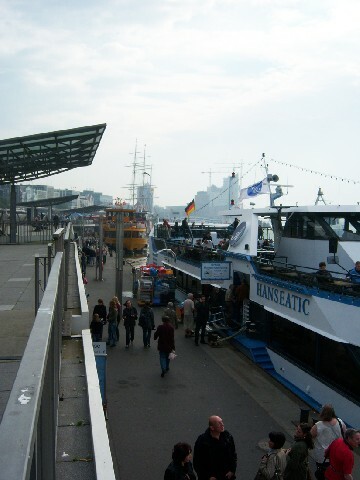 At the dock side of the Landungsbruecken are also small restaurants and I remember well eating with Olivia, my daughter, now many years ago a Hamburger Aal Suppe. The ingredients are fish broth with fresh eel, pears, potatoes, vinegar, herbs and spices. Oh, yes, a traditional sweet-and-sour soup that may today only be found on a specialty restaurant menu. 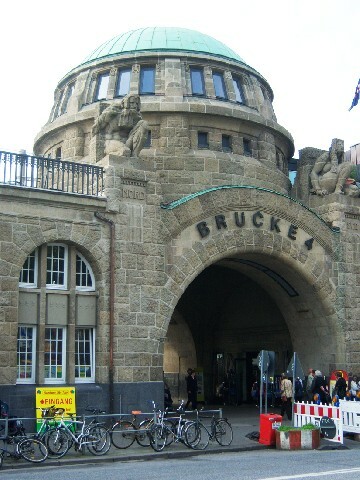 Our next destination was the Alter Elbtunnel (Old Elbtunnel), opened in 1911 to connect one side of the harbor with the other side, 24 m (60 ft) below the Elbe River. Big elevators load, unload and transport cars, bicycles and pedestrians from street side far down and up. Cars then drive through one of two tunnels, where bicyclists and pedestrians can cross the 600 m (660 yd) length of the tunnel as well. And, of course, the traffic also happens in reverse direction. 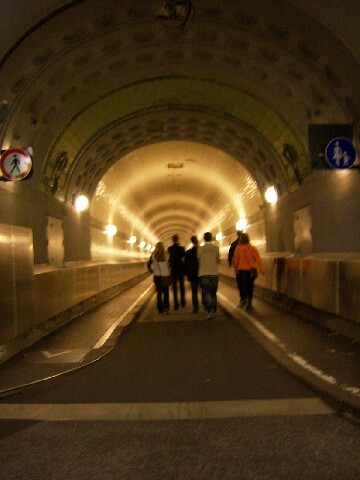 We drove and walked the tunnels many times, while growing up. Four new Elbe-Tunnels connect all areas of the harbor today via an Autobahn (Highway) as well as bridges. On the day of our visit the Old Elbtunnel was only open for pedestrians and so we made our way down, below the Elbe and admired the construction of a 100 year old engineering and architectural feat. 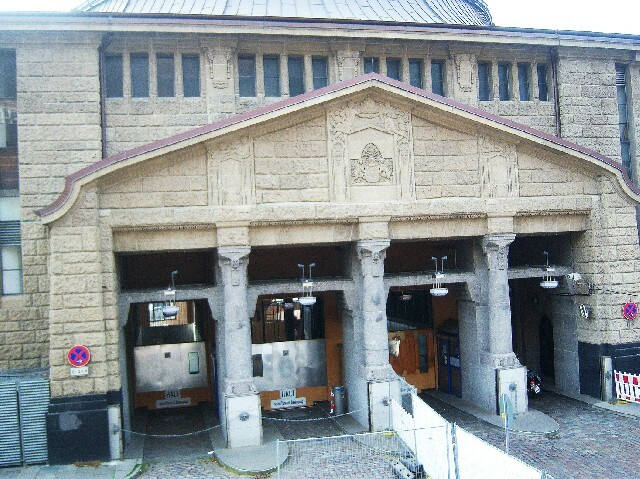 The Old Elbtunnel has been declared a Heritage Site, and is being carefully maintained for future generations. It only costs 2e to drive a car through the tunnel. 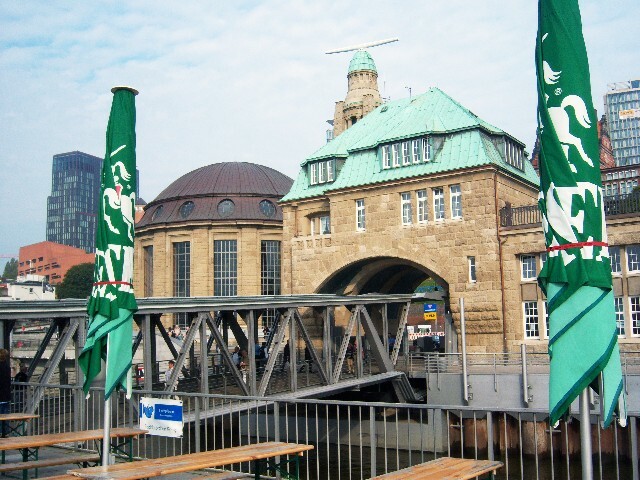 Next we stopped at the world-famous Hamburger Fischmarkt, the fish market, which happens every Sunday from 5 am to 9 am. It is a fabulous spectacle, attended by Hamburger (!) and visitors alike where fish can be purchased directly from boats at the dock. The market-square is filled with stands and booths, where anything edible and non-edible may be for sale any given Sunday. The banana truck was always the most entertaining: A merchant would throw bananas into the crowd and then auctioned off small and big loads of bananas. Well, we missed that spectacle. Not far from there, contemporary business buildings have sprung up, the most interesting one in the form of half a pyramid. 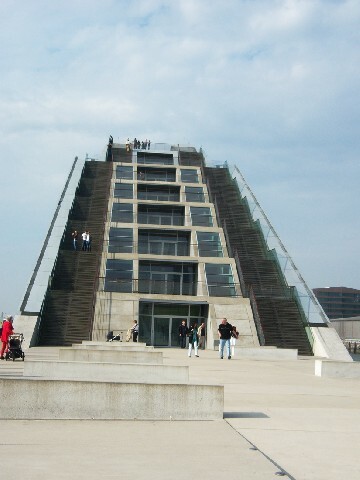 We could climb it and had fabulous views across the harbor and far along the Elbe in the direction of the Baltic Sea, the river’s final destination. 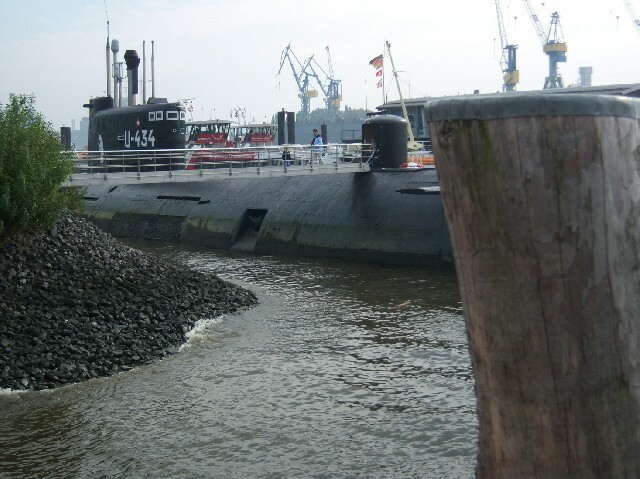 Then, along the Elbe we came across a docked schooner and U-Boot (U434), the dark hulk of the U-boat above the water line. A couple of huge freighters were slowly making their way along the Elbe toward Hamburg Harbor. The Elbe Philharmonic Hall is being built in another section that we did not visit that day. The ultra modern concert hall is now scheduled for opening in 2017. Parts of a series of 19th Century picturesque storage facilities, the Speicherstadt, recently transformed into fashionable condominiums, others now house small museums.The Speicherstadt has been named a UNESCO world heritage site. At the time we noticed that at high tide the river actually flooded some of the area. Monika and Gerhard Pott’s own sailboat, named Poettchen, is docked at the Elbe, from where they sail every summer for three months on the Baltic Sea. 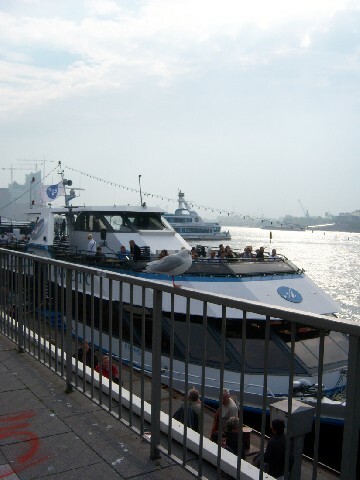 Last year to Sweden, other summers along the coast and ports of East Germany and as far as Poland. They still live the harbor and sea-side life, whereas we are land-locked in the Berkshires of Western Massachusetts. Yet the ocean, any ocean, continues to be my siren calling.